Here are links to a number of Argles photos that may be of interest to some of the family. I have specifically avoided including photos of living folk or parents of living folk simply because I am paranoid about identity theft. This is a reasonably accurate copy of a coat of arms that is painted onto deerskin and has been in the family for generations. The original is with my cousin Bill, who is the oldest son of the oldest son, going right back to the original Thomas of Sutton Valence, as far as I can make out. 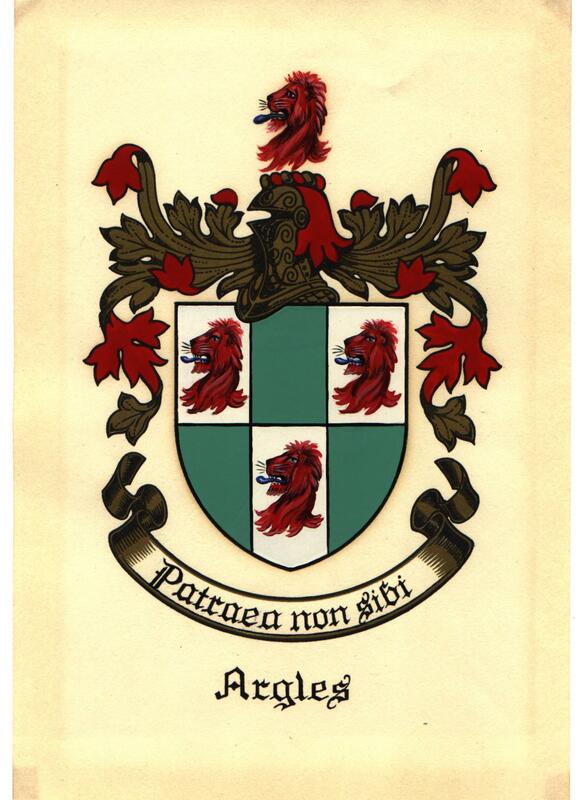 The coat of arms is very like that of the Argall family (but not identical), which has led a number of Argles's to believe there is a link, but Ian Argall of Cornwall has now persuaded me that my favourite possibility is wrong, so I guess it's back to the drawing board. William Thomas, who lived from 1857 until 1933. In 1887, he married Helen Gertrude Callum, who lived from 1864 until 1926. Their children were Rosa, William Archambo (1890-1975), George, Woodfield Henry, and Ruby. Helen Gertrude Callum, who married William Thomas. William Archambo, who lived from 1890 until 1975. In 1908, he married Julia Maude Ambridge, who lived from 1887 until 1972. By the way, notice that the Archambo name is being carried down as a second name. That goes back to Esther Archambo, wife of Thomas of Maidstone (1735-1808). Julia Maude Ambridge, who married William Archambo.